Forklift Hoisting Hooks, Jib Boom Cranes, Powered Jib Boom Lifting Crane for Forklifts, Fork Lift Bulk Bag Lifter at Global Industrial. 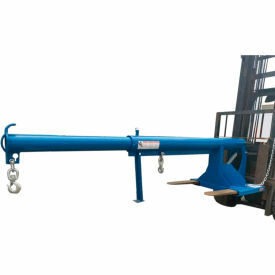 Forklift Hoisting Hook Attachments convert your Forklift into a Mobile Lift Crane in Seconds! Forklift Hoisting Hook Attachments easily attach to a forklift. Swivel hook includes a safety latch. Made with all welded steel and features a safety strap. Auto-Tension Hoisting Hook offers a unique design that adds tension as weight is added. Forklift Telescoping Jib Boom Cranes convert Forklifts into Mobile Jib Boom Cranes for Construction and other Material Handling Applications. Forklift Telescoping Jib Boom Cranes are made of powder coated steel to provide long lasting durability. Forks of the counter-balanced forklift truck slip into the fork pockets of the Jib Boom Crane. Capacities 4000, 6000, and 8000 lbs. Extended lengths are 145", 153-1/2" and 153-3/4". Retracted lengths are 68", 85", 86" and 86-1/4". ** "S" Dimension is the dimension from the center to center of the fork tine sleeves. NOTE: OSHA requires contacting the manufacturer of your forklift truck for written approval for the use of any forklift truck attachments. Vestil "Shorty" Forklift Jib Boom Cranes are Perfect for use in Tight, Restricted Space Areas. Vestil "Shorty" Forklift Jib Boom Cranes include integral fork pockets, safety restraint and 2 hoisting hooks (one swivel, one rigid). Heavy duty robotically welded steel construction features a durable chip-resistant enamel finish. Adjustable Pivoting Forklift Jib Boom Cranes convert Forklifts into Mobile Jib Boom Cranes for Material Handling Applications. Adjustable Pivoting Forklift Jib Boom Cranes are made of powder coated steel to provide long lasting durability. Quickly converts into a mobile pivoting boom lift. Perfect for when job includes high and hard to reach objects. Capacities 3000, 4000, 6000 and 8000 lbs. 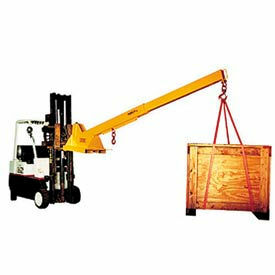 NOTE: OSHA requires contacting truck manufacturer for written approval for the use of any fork truck attachments. Caldwell Heavy Duty Adjustable Forklift Jib Boom Cranes convert your Fork Lift into a Versatile Mobile Crane. Caldwell Heavy Duty Adjustable Forklift Jib Boom Cranes offer an adjustable telescopic reach of up to 12 feet in 12" increments, and adjust vertically in five elevations up to a maximum of 40 degrees (76") in height above horizontal. Portable and compact lifting booms easily fit standard forklift trucks, and include a hand pull with a locking T-pin at the end for easy extension. 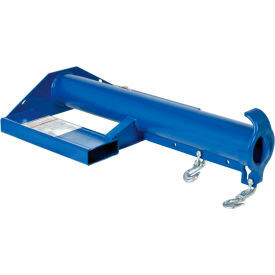 Mobile Jib Cranes also include a restraining chain with grab hook for safety. Swivel hooks have safety hook latches. Heavy duty steel construction with a durable enamel finish. Meets ANSI/ITSDF B56.10-2006, Part III, 7.4.5 standards. Note: Fork Pocket Spacing is the maximum usable width between fork pockets. 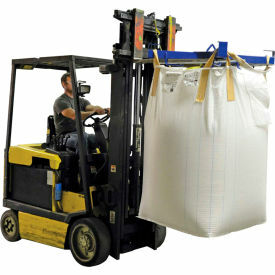 Vestil Bulk Bag Lifter is for use with a Forklift Truck or an Overhead Hoist. The Vestil Bulk Bag Lifter eliminates workplace hazards and injuries associated with packing and unpacking bulk bags. 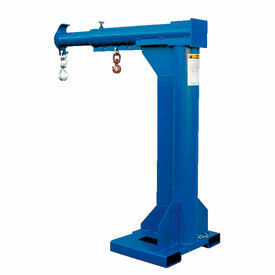 This Forklift or Hoist attachment reduces labor costs, injury related claims and increases productivity. The unique design improves existing equipment flexibility and the return on your forklift investment. 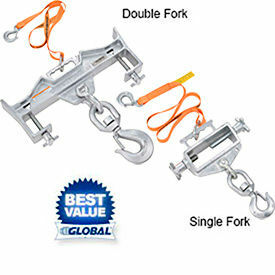 Lifter features 6-¾" x 3-¼" forklift fork pockets and a 4-¼"L x 4-5/8"W x ¾" thick bail for use with an overhead hoist. Integral 1-½" hook opening bag strap retainers and a liner retainer are standard. Welded steel construction features a durable blue powder coat finish for long life. Vestil High-Rise Forklift Jib Boom Cranes offer a Taller Overall Height for applications Requiring Additional Reach. Vestil High-Rise Forklift Jib Boom Cranes include integral fork pockets, a safety restraint and 2 hoisting hooks (one swivel, one rigid). Heavy duty robotically welded steel construction features a durable chip-resistant enamel finish. 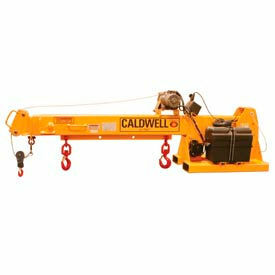 Caldwell Powered Forklift Jib Boom Cranes are Precision Lifting Booms that Expand your Lifting Capabilities! Caldwell Powered Forklift Jib Boom Cranes combine the reach of a forklift boom with the precise lifting of a hoist. Unique design allows the user to "thread the needle" in close clearance situations, allowing you to reach in and pick up hard to get loads. Portable and compact lifting booms fit standard forklift trucks and are an economical alternative to overhead or gantry cranes. Telescopic boom adjusts horizontally in 12" increment. Lifting hook travels 19' when boom is retracted using a remote pendant control with a 12' cord, and hoist hook speed averages 7-½ FPM. Self-contained 100 amp 12V DC deep cycle battery allows use of the boom with no special power requirements, and unit includes a 25 amp battery charger that recharges the battery in 4 to 5 hours. 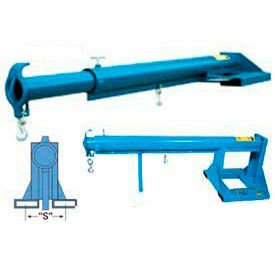 Jib Cranes include a restraining chain with grab hooks for safety. Heavy duty steel construction with a durable enamel finish. Meets ANSI/ITSDF B56.10-2006, Part III, 7.4.5 standards. Pivoting Jib Boom Crane adjusts vertically in five elevations up to 69-½" from the base of the lifting hook above horizontal (31" from the base of the boom hook). Vestil Shorty Forklift Telescopic Jib Boom Crane LMS-EBT-46-4 4000 Lb. 24"